Kazuma Kiryu returns next month when Yakuza Kiwami 2 comes to PC on May 9th. Pre-order the game today to get bonus DLC and save 10% off! Experience the next chapter in the Yakuza series as Yakuza Kiwami 2 is coming to PC next month on May 9th. Taking place after the events of Yakuza Kiwami, our hero Kazuma Kiryu is called into action again to face off against new foes. The game, originally launched on the PS4 in December 2017 is finally making the jump to PC and will be rebuilt from the ground up with the Dragon Engine. Featuring 4k resolution support, unlocked framerates, customisable controls and a variety of graphic options to make the game look the way you want! The game also includes a number of mini-games, such as the Cabaret Club for belting out those tunes or Arcade games such as Virtual On, Golf Bingo and Toylets (not to be confused with Toilets). 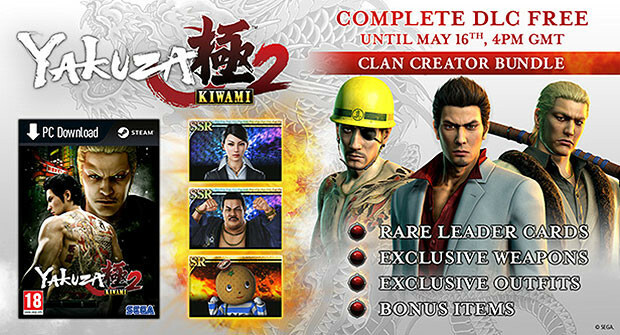 Kiwami 2 also features the "Majima Saga", which gives allows players to play as Goro Majima in his own playable adventure revealing events that occur prior to the game. Take a look at the new trailer while you wait. Yakuza Kiwami 2 launches on May 9th. Pre-order the game today to get your key instantly and save 10% off! You'll also get the Clan Creator Bundle DLC, which adds Rare Leader Cards, Exclusive Weapons, Outfits and Bonus items to the game!